A new project is being launched which will help with the transfer of patients between care homes in Solihull and our hospitals. The red bags scheme is a simple but effective way of improving communication between home and hospital – and it is also makes life easier for the patient. 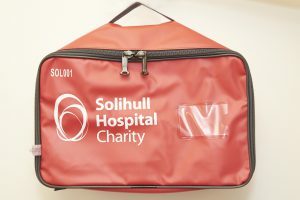 The bags, which have been funded by Solihull Hospital Charity, will be used to ensure that personal belongings, medication and documentation are kept together and are transferred smoothly from care home to hospital – and back. The bag stays with the patient from the moment they leave the home until they return once they have been discharged from hospital. It contains standardised information about the resident and a section for personal belongings such as glasses and hearing aids. The idea was first brought in at Sutton in Surrey where it was found that residents with a red bag spent four days less in hospital than those without a red bag. The scheme cut down on unnecessary delays by keeping all the important things in one place. The project involves our Trust, Solihull care homes, Birmingham and Solihull CCG and West Midlands Ambulance Service and it is currently being rolled out across the area. The Trust’s Support to Care Home project is currently launching this to the care homes in Solihull. The team can be contacted on 0121 705 0912. Divisional Head of Nursing Ann Edgar said: “I am delighted that we are launching the red bag scheme in Solihull. Similar projects have proved a great success in other parts of the country with many benefits for patients and staff and I am sure it will be the same here.